For all the religious anecdotes (inappropriate or otherwise) one could make about Jorge Jesus, Benfica’s coach, one thing is certain. He would be the first person wishing he could work a miracle or two given the last few weeks for his club. In the space of 5 days, Benfica, fresh off an incredible unbeaten streak domestically (their last defeat coming over a year ago on the 9 April 2012 to local rivals Sporting) suddenly saw the incredible foundations of a promising season crushed with back to back defeats to Porto and Chelsea in domestic and European competition. Any Benfiquistas seeing trebles in their eyes came straight back to Earth with a devastating halt. It wasn’t just the fact that Benfica lost those matches too. Consider the significance of the league run – Benfica had been in pole position in the league for the last 8 rounds, with just 2 to play. And even after the match against Estoril didn’t go according to the script (drawn at home), it was still Benfica’s title to lose going into the visit at the Dragão, with the Eagles 2 points ahead. Jesus could hardly have masterminded a better title challenge than this… or could he? Regardless, Porto effectively dug a knife and twisted it deeply as the winner, scored in the 92nd minute, left Benfica with no chance to recover the match, and the title with it. Suddenly all the efforts of staying just a step ahead of Porto for most of the season collapsed. Months of outstanding results – now fruitless. To respond from such a demoralizing defeat with such a spirited performance against Chelsea in their first European final for 23 years seemed unlikely – but that’s what Benfica delivered. Yet fate dealt a cruel blow again, waiting till the 92nd minute to deal its hand through Ivanovic’s header. The defeat to Guimarães in the final of the Taça added insult to injury. According to Jesus, the team set out to defend their slender 1-0 lead, which was concerning for two reasons. Benfica clearly don’t know how to defend slender leads in pressure matches; and this strategy was an unusually timid choice given the Eagles’ superior squad. Benfica should have gone to the final planning on putting in a solid shift. Instead, as the 2nd half wore on, the Eagles looked lethargic and complacent, and this ultimately was deservedly punished. Last season, Champions League winners Bayern Munich’s season looked a far cry from their current campaign. In 2011-12, Bayern were runners-up in all respects – the Bundesliga, the DFB-Pokal (German Cup) and the Champions League. A season that held promise for 3 trophies unraveled. This wasn’t a terrible Bayern side at all – after all, no-one gets to a Champions League final in particular by accident – but somehow, even in front of their own fans in the final, the ball didn’t want to go in often enough. A trophyless season that was deemed by some as a failure, yet Bayern got to the last hurdle of all their races, and were possibly unlucky to lose the latter two in particular. Benfica’s season looks remarkably similar in a sense – their league performance has been even better. It took penalties for Braga to eliminate the Eagles in the semi-finals of the Taça da Liga. They reached the final of the Taça da Portugal. They reached the final of the Europa League. They finished 2nd by a mere point in the Liga, winning 24 of 30 games. They’ve did this despite various setbacks and challenges. A bizarre incident in a pre-season friendly which left captain Luisão suspended until November. The deadline day transfers of (then) crucial midfielders Javi Garcia and Axel Witsel. And a squad (arguably) light on depth in key areas, especially in midfield and fullback positions. It suggests some debate – has it really been a poor season for Benfica? Is it worse to lose at the final hurdle instead of being tripped up halfway during the race? Does Jesus get judged on the trophies and nothing else? And what, if anything, lacks in the Benfica setup that could have been fixed to avoid a possible treble of missed opportunities rather than trophies? The notion behind the tweet above by Bruno Araujo is not uncommon. There’s a fair suspicion held by many that in the “big” games, Benfica flatters to deceive, relying too much on Porto’s mistakes to prosper domestically, or on superior talent to prevail on the field. Similar sentiments are held when Benfica play top sides in the Champions League. It’s a fair statement given the current season. The Europa League final is a perfect example of this, where Chelsea’s experience from 3 major European finals in 5 years clearly counted in their favour in winning the game despite playing up to Benfica’s dominance. Even though domestically, Benfica were quite unlucky to lose to Porto recently, the fact is that Jesus’ record against them in the league generally makes for poor reading. Under Jesus, Benfica have beaten Porto once in league competitions, in his very first encounter against them in 2009. The last couple of matches against Porto seem to always become crucial in swinging the league title. Last season, 2 defeats in 3 games (including a crucial one to Porto) effectively lost the momentum needed to catch the eventual winners, despite winning 8 league matches in a row prior to that. Big match temperament remains an issue. The team does certainly possess some capable characters who haven’t gone missing in some of the big matches (Matic, Pérez come to my mind at least). Composure isn’t consistent, but this team did play better this season than the last. If anything, Benfica’s over-reliance on certain players to always perform is perhaps what cost them most. If they seem to run out of steam towards the end of the season, questions should be asked of how “fresh” the alternatives are. For example, were Matic and Pérez over-utilised? Are we really surprised that alternative players were ineffective if they were not used? An example is Carlos Martins, who got himself sent off in Benfica’s crucial draw against Estoril. That result is the one which Jesus himself admitted probably lost Benfica the title. However, even when looking at the Porto and Chelsea matches as examples – ironically, one could argue Benfica didn’t lack a mental aptitude to execute the tactics presented to them. What could be argued as a lack of big match temperament could easily be called bad luck. Benfica defended Porto fairly well for 70-odd minutes, forcing Porto to open up the game more to press the advantage. Had Kelvin not managed to get a yard on Maxi Pereira to score the winner for Porto, it would have ended a draw at the Dragão, and Benfica would have had their resolve celebrated, not condemned. Similar arguments can be made for some of the play in the Europa League final. Benfica created chances that were there to be taken – Chelsea set out to defend, and they did so quite well. In both these matches, the margins for error were desperately thin. The best example where the big match tempers clearly failed miserably was the Taça final against Guimarães, where Benfica seemed far too relaxed with matters – and were rightly and duly punished. Small margins for error and bad luck in some cases doesn’t mean Benfica didn’t contribute to their failings. It begins with Benfica’s squad, and the way the team’s tactical set up has worked. Typically, Jesus’ strategy has relied substantially on utilizing players with greater technical skills, able to execute the possession style quick passing movement, layered with some ability to beat opposing defenders off the dribble to create space for teammates. Tim Palmer’s excellent scouting report highlights this in how Benfica play their football. Jesus has tried to build a side versatile enough to play as the aggressor, often enjoying far more possession and being invited to take the attacking initiative against most sides in the Liga that sit deeper than become adventurous against the strong Benfica attack. It’s not often that Benfica play sides with the stronger lineups of Chelsea, but when they do, Benfica are capable of playing deeper and relying on direct counter-attacks (as they displayed against Porto) but this happens far less often as the Eagles become more confident of their attacking brand of football. Attack has never really been the problem though. Benfica have managed to win marginally more games this season (39 out of 56 thus far vs. 34 out of 52 last season). The acquisitions of striker Lima has offered a few things - additional mobility and speed for variations to creating space in the box, an alternative style of attack, or if nothing else the chance to give Cardozo a rest. Signing Ola John has also offered cover for Gaitán, or the option to play both of them in a 4-2-3-1 formation with Gaitán in a shadow striker role. Benfica’s improved attacking prowess (123 goals in 56 matches this season vs. 105 goals in 52 matches last season) is impressive considering limited use of a CAM (central attacking midfielder) this season to add depth and space to the attacking effort. Previous seasons saw the genius of veteran Pablo Aimar or the talented Axel Witsel orchestrating the space in the middle to complement the threat on the flanks, sitting in the middle of the 3 in a 4-1-3-2 formation. This season, the shape has changed sometimes to a loose 4-2-2-2 or 4-2-3-1, where Matic sits deepest, with Pérez slightly ahead of him playing a more box to box role (It’s not dissimilar to the diamond formation Benfica used in Jesus’ first season in charge, except with the central midfielder playing a less advanced role). It’s a change which has adapted the team’s attacking shape, forcing Gaitán (or Ola John) and Salvio to cut inside towards the middle, making the fullbacks Melgarejo and Pereira push further forward to offer width. But using that system comes with risks – the attacking shape of Benfica demands that even Matic (as the cover in front of the centre backs) often sits further forward than one would expect, making the team vulnerable to counter attacks, especially if Maxi and Melgarejo have pushed further forward, and the only protection is an average paced Garay and an aging Luisão. Jesus has always favoured playing a high defensive line. But using one requires the right personnel to manage its risks. Last season’s disappointments were almost at time blamed exclusively on former left back Emerson, whose lack of pace was an easy weakness to exploit in a system that is sensitive to the quality of the fullbacks pushing up to support the attack. Benfica still haven’t successfully replaced Fabio Ceontrão, who was the only player who arguably possessed the right blend of attacking and defensive qualities required in such a system. When teams are able to pressure the Benfica full backs into their own area, it effectively nullifies the possession football Benfica play. Matic, Garay and Luisão are used as “safety-nets” to pass back to in order to prevent loss of the ball and keep the pressure going, while the fullbacks offer width. When the width disappears, the other 3 players are forced to retreat backwards to cover the spaces in the centre, meaning they’re defending deep instead of playing in the middle of the field, supporting the attack and ball retention. This is exactly what Porto achieved to great effect in the Clássico recently, creating a massive gap between Lima and the rest of the Benfica midfield, which is why the Benfica attack were so ineffective at retaining the ball. Ironically, the tactical adjustments made by Vitor Pereira in the second half played to Benfica’s advantage – the substitutions spread Porto far wider into a 4-4-2 formation, which created far more space for Benfica to use through the middle, and perhaps led to that crucial moment when Maxi Pereira decided to push a little too far forward than he should have. How ironic that a season after lamenting the weaknesses down Benfica’s left flank, Porto found their winner down the opposite one. The Europa League final exposed similar weaknesses but in different parts of the pitch. Chelsea resorted to their now infamous “sit deep and counter quickly” strategy, even deciding early on that the key flank to attack was down Benfica’s left, where Melgarejo was identified as the weak link. To his credit, the young Paraguayan did a good job to contain the counters by former Benfica player Ramires. With young Portuguese fullback Almeida impressing again on the opposite flank against a much slower threat in Oscar, Chelsea decided the weakness to exploit was right down the middle. Garay missed the flick-on to Torres, and while Luisão did well to match Torres’ speed, his decision to try and make the tackle was (harshly) the wrong one as it gave the Spaniard the chance to get in behind his marker and create the one-on-one situation. In that particular passage of play, ironically, it’s not even a “classic” counter attack. Cech started the move, and Benfica were very slow to adjust from their positioning in midfield. It stands to reason that if Benfica are going to continue to play with a higher line, one of two things needs to change – their ability to break down teams that sit deep and defend well (which they don’t lack, mostly), or their ability to recover against counter-attacks. Against Chelsea, Benfica’s attacking prowess was wasted if it wasn’t going to produce the goals it warranted – weaker teams in the Liga will inevitably buckle, but Chelsea won a Champions League title because they can defend rather well for long periods. Benfica may have looked impressive – but it wasn’t going to work unless the countless half-chances turned into goals. Ironically, Benfica may have been better served to switch the tactics slightly they employed in the Porto and Chelsea matches; sitting on the counter against Chelsea would have forced the Blues out, exposing their lack of speed at the back, while being more aggressive with Porto once they’d made the switch to 4-4-2 could have been worth the risk given how many players they were committing forward. But all this easier said in hindsight, right? It then raises the question, once again, of tactical choices. Few could blame Benfica for playing for a draw against Porto. Yes, it wasn’t necessarily positive, nor did it illustrate the “courage” many Benfiquistas would desire of the team – but it did illustrate a bit more thought in game management from the manager and his team. No need to risk it, after all – and the team was set up to defend and counter even on the team-sheet (although the presence of Cardozo to hold up the ball wouldn’t have gone amiss). And again, Benfica executed this largely well, limiting the opportunities for Porto to score very well. If Kelvin hadn’t found the pace in behind Maxi Pereira, Jesus’ chosen approach would have won him plaudits. Instead, football is a dramatic game of margins, and few – even Porto fans – will give Vitor Pereira any credit for masterminding back to back Porto campaigns with just 1 defeat. But that is exactly how small the margin for error is, and Benfica may well focus more on other dropped points (Estoril earlier in the week, or any other draw earlier in the season – the draw at the Luz to Porto was also quite important) as the key points when the season’s campaign was lost. Benfica shouldn’t have been going into this game relying on its result. Especially when there appears to be a latent inability within the team of knowing how to win matches against Porto. If Benfica are going to be champions again, it’s coming to the point that they need to figure out how to win the other 28 matches to minimize the impact of maximum points dropped against Porto, since they clearly do not yet know how to dominate their rivals. Against Chelsea, the chosen tactics were again well executed, the surprise name on the team sheet (Rodrigo) started well, and even for the weaknesses in the high defensive line, Benfica coped well for a time against Ramires and Torres, and even managed to limit the dangerous through-ball vision of Mata, Oscar and Lampard. Their ruthlessness was the issue – and an experienced side like Chelsea was always going to find “that” chance to score at the worst possible moment. Were the tactics correct? It’s difficult to say, because Chelsea are the kind of side that didn’t need to be the best team on the pitch to win the game, but Benfiquistas don’t exactly get enamoured with confidence when games are approached passively by their side either. In the Taca, Benfica started brightly, and even got a slice of luck for the opening goal – but they played in the second half like a frightened team, anxious to avoid mistakes, instead of being more assertive and confident. Guimaraes’ persistence paid off. They didn’t win by being more skilled or tactically astute – they won because Benfica lost the mental battle in their own dressing room. 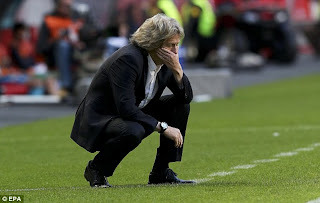 For some – me included – Jorge Jesus still doesn’t truly convince as the tactical mastermind. Granted, his team hasn’t performed poorly this season overall. The results at the end, though, will not show it, and there is significant mixed opinion about him. In one camp, the argument is based on the appreciation of his determination to raise this club to its previous heights, combined with some solid attacking principles, some great development of players and excellent scouting. Mistakes have been punished very harshly – but again, it’s 2nd place by 1 point. Two finals out of three. The team made it to the final hurdles but didn’t win the race. Margins defined by bad luck and silly mistakes. Therefore, keep Jesus – if he’s made the mistakes, they are few. The other camp still considers the notion that a weakened Porto has yet again managed to undo the Benfica team – largely due to the latter’s inability to capitalize on the misfortunes of their northern neighbours. The margins for error weren’t forgiving, but Benfica haven’t managed their options well either. Following their dramatic win away at Maritimo, causing scenes of highly premature celebration by the Eagles, there can be arguments for some poor management of the fixture at home to Estoril. Take nothing away from the visitors, but fate seemed to play with Benfica when Pérez had to leave the field early with injury. Benfica’s over-reliance on Matic and Pérez perhaps has cost them this season. It’s easy to speculate after the fact, but I’m not so convinced Benfica would have suffered in matches like this had Jesus actively kept other players involved. Existing squad weaknesses also weren’t understood and addressed, especially at fullback. Melgarejo hasn’t consistently inspired confidence, and it’s proven by the fact that the experienced heads at Chelsea decided his flank would be the epicenter of the majority of their attacks in the majority of the Europa League final. Benfica also didn’t manage the weakness in pace with the centre backs (a key issue that was exploited successfully by opponents in the last few matches of the season). Park the debate about Jorge Jesus for a second. Whether he stays or goes, or should stay or should go, despite the great performances in 2012-13 being undone in a few weeks, Benfica should reflect on the potential. The club’s consistency in Europe over the last few years has seen them rise in the UEFA rankings to 9th place. After dropping to Europe’s second tier competition, they reached the final, and were a worthy contender to win the whole thing, losing only to a team who undid Barcelona and Bayern Munich a mere 12 months prior. They lost one game the entire domestic season to a side who haven’t tasted league defeat for over 50 games. They reached the semi-finals of one cup competition and the final of the other. All this while missing their captain for nearly 3 months, and conceding to the sale of 2 of their most influential players, and still lacking a proper left back! Many of their players stepped up and matured in various respects, especially Artur, Matic, Pérez, Gaitan, Ola John, Salvio, Cardozo, Lima and Garay. Youngsters showed promise, especially Andre Gomes and Almeida. Mere seconds separated Benfica from glory against Porto, and more time to claim it against Chelsea. They aren’t the first team to concede crucial goals in the 92nd minute – they won’t be the last. They messed up against Guimarães – but they learnt a valuable lesson in being reminded to never underestimate whatever opponent is in front of you, regardless of perceived advantages. So perhaps not a bad season. Certainly a season that for a time, many Benfiquistas could be proud of – and one that, regardless of its results, add hope of future glory. The debate then – would a manager other than Jesus have avoided the above? Would a manager other than Jesus also have experienced the same bad luck? Or would they have won something? Or maybe even a historic treble? Citing the comparison earlier, Bayern kept Jupp Heynckes after last season’s treble of disappointments… but Jupp has history. He’s got the results before. He’s done it. He doesn’t need to talk it up. Those of us who remain unconvinced by Jorge Jesus, especially should he remain at the club… will demand much of him next season. The bittersweet end to this season, for many, including me, turned him from destined messiah to unconvincing preacher, because after all, in the end, performances are not the currency of football – results are. Therefore Jorge Jesus - the lessons should have been learnt loud and clear by now. If you stay – you’re on borrowed time. This article also appeared on Outside of the Boot in May 2013.